I made a big decision over the weekend. I don’t know what prompted it… perhaps it was spending most of Saturday in the basement in my sewing area, staring at all the fabric I have. Perhaps it was looking at the pile of fabric in the laundry basket on the floor that still needs putting away. 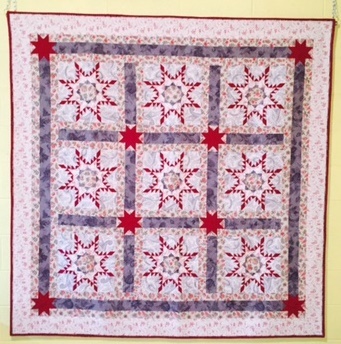 Or maybe it was looking at several of my older quilt books that show quilts from the 1800’s made from scraps. Whatever. I have decided to make a New Year’s Resolution for 2009. The only fabric I will purchase for quilting will be for the backing of any quilts I make. And, maybe I can get by without even buying those! I have tons of solid fabrics, and have been looking at Amish quilts lately. I love their boldness, and over the past year or two, have noticed the emphasis in decorating towards big splashes of color. So I have several quilts floating around in my brain that will help me reduce the amount of fabric I have while creating some (hopefully) beautiful quilts. It’s a personal challenge, and I like trying. « We Have a Stash Winner! I think there will be plenty of company with you on your Shop the Stash adventure. If you need to trade, let me know! Good for you!! !My start with quilting (5 years ago) had me buying all kinds of patterns, books, and fabrics, without accomplishing much. Two years ago I promised not to by any books or patterns for a year, and only buy a coordinating fabric in the amount needed on a project “I was working on”. I did really well!!! !I too will try what you have purposed for this upcoming 2009…Happy stitchings! I have been buying an awful lot of fabric lately as well and plan to have a significant decrease in my purchases next year as well. But – I do love to get new fabric – so hopefully my Fat Quarter club from the Fat Quarter shop will satisfy my fabric addiction. Now that I have reorganized I have found a bunch of projects I really want to work on – that is a good thing! Ha, Caron – may I come over the admire all your fabrics? I have to admit I am not too much of a stasher even though I love love love fabrics.